Are affluent nations doing enough to avert disaster? Widespread famine threatens more than 40 million people in Africa, including 14 million in southern Africa and another 14 million in Ethiopia. Drought is partly to blame, as is the HIV/AIDS pandemic that has killed or sickened millions of farmers who would otherwise be planting or harvesting crops. Africa-watchers also blame corrupt and inefficient governments. Some aid experts say the United States isn't helping matters by donating genetically modified (GM) corn to needy countries, a number of which question the safety of eating the food. They also fear that farmers will use GM seeds to plant crops that could contaminate the continent's non-GM strains, possibly making them unfit for export to Europe. 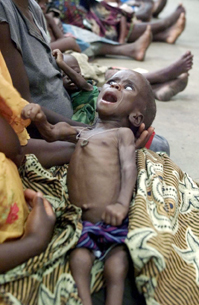 But Americans and others say GM food is perfectly safe and should be used to feed Africa's starving people.